In the following article, I have linked to products from my affiliate partners that I personally use and recommend. Recently a friend asked me exactly how I soak my nuts and what I do to dehydrate the nuts after soaking. She had read about phytic acid and the importance of properly prepared grains and nuts but just didn’t know how to do it! So, I thought maybe some others would like a step by step tutorial. But, before I get to the nitty gritty of the how-to’s, let’s review a bit. You probably already know how important it is to properly prepare your grains and nuts, but if not, see Grain Preparation for more information. Do you remember what phytic acid is and what it does? In-home food preparation techniques can reduce the phytic acid in all of these foods … effective methods are soaking in an acid medium, lactic acid fermentation, and sprouting. Phytic acid is an anti-nutrient. It prevents your body from absorbing minerals and binds with them to make them unavailable to the body for use. 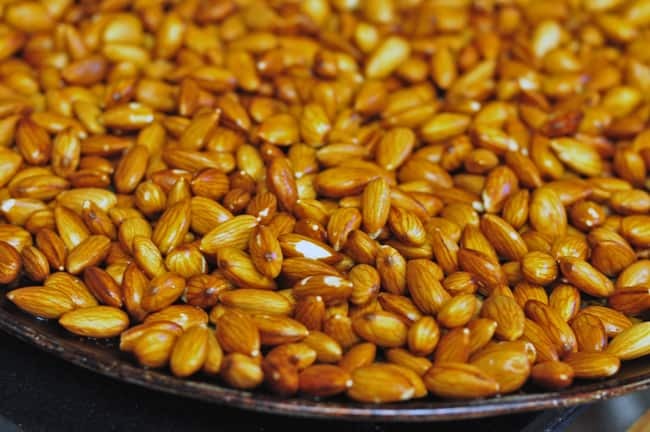 Sprouting or soaking the grains overnight is a very easy way to properly prepare nuts. When you hear the word, “sprouting”, if you are like me, you think of the little sprout that comes out of the seed or nut after it is soaked and left for 1 to 3 days. Soaking overnight also sprouts the nuts but the little sprout is microscopicly small. Proper preparation of nuts and grains neutralizes the phytic acid making them more easily digested plus increases the nutritional value! The following tutorial is based on the Crispy Nuts recipe found in the Nourishing Traditions cookbook written by Sally Fallon. I think this cookbook is a must for every REAL food kitchen. If you don’t have it yet, you are in for a treat! This is an easy way to properly prepare nuts so as to neutralize phytic acid and make the nuts more digestible. Crispy Nuts is a great start to delicious homemade trail mix – my children love it! 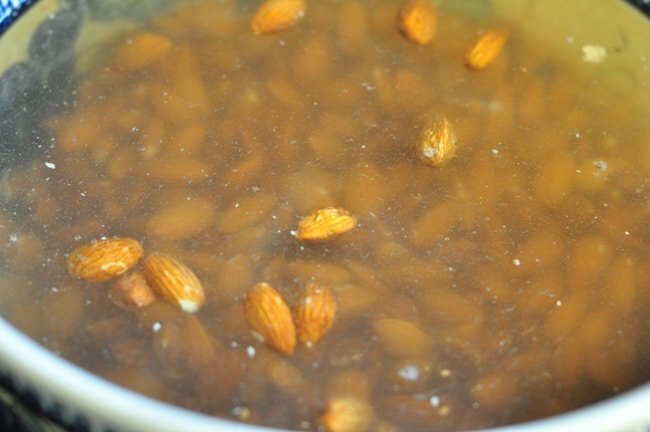 Mix the nuts, salt and water and leave overnight to soak. 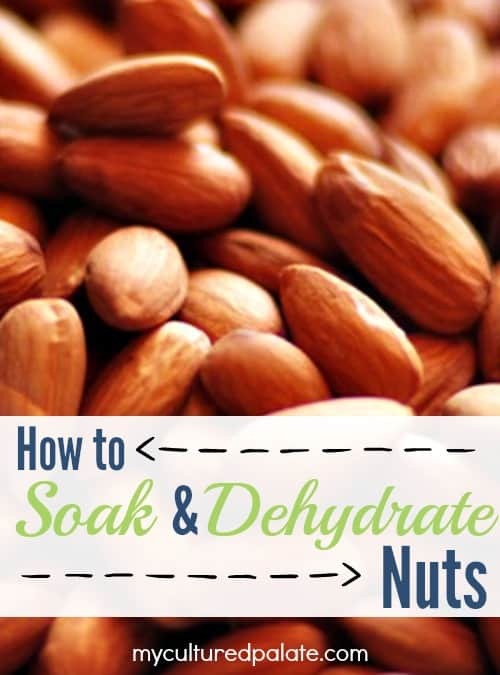 In the morning, drain the water from the nuts. I don’t rinse them – they are good with a hint of saltiness. Spread the nuts on a cookie sheet. Place in a warm oven – 170F for 12 – 24 hours – My oven only goes down to 170F but if I am using the dehydrator, I set it to 150F. Stir occasionally (if you think about it) until the nuts are completely dry and crisp. Make sure to dry the nuts completely or they may mold if kept over 2 weeks. * Cashews take a bit more care because even if they are “raw”, they have already been heated twice during processing. Do not soak cashews too long or dry them out too slowly – they develop a bad taste. For cashews, soak in salt water for 12 hours and dry in an oven set to 200F. ***I buy all my real salt and spices from my affiliate partner, Starwest Botanicals, because of their superior quality. Their herbs & spices are organic, non-irradiated plus, I think they are more aromatic and full flavored than any others. In the morning, drain the water from the nuts. I don't rinse them - they are good with a hint of saltiness. Place in a warm oven - 170F for 12 - 24 hours - My oven only goes down to 170F but if I am using the dehydrator, I set it to 150F. Stir occasionally (if you think about it) until the nuts are completely dry and crisp. Make sure to dry the nuts completely or they may mold if kept over 2 weeks. Cashews take a bit more care because even if they are "raw", they have already been heated twice during processing. Do not soak cashews too long or dry them out too slowly - they develop a bad taste. For cashews, soak in salt water for 12 hours and dry in an oven set to 200F.